To my lasting regret, I ignored the word-of-mouth Das Racist got rolling after they played New York’s CMJ Music Marathon in late 2009. For one thing, the name put me off — indie-rock “irony” about race is rarely as clever or harmless as it pretends. Nor was I psyched to learn they had a viral hit — most such contagions die out in the cold light of the following week. But while I stand by both these prejudices, I’ve outgrown the third: fear of downloads. In tribute to the advisor who belatedly helped me get both the band’s terrific free 2010 mixtapes onto my computer, I just entered “das racist shut up dude download” and “das racist sit down man download” into a handy nearby search engine and determined that both titles remain safely available. Take advantage of this opportunity before it slips away the way Das Racist did when they broke up early this month. At the very least, those who’ve never heard the timeless novelty “Combination Pizza Hut and Taco Bell” should watch a YouTube video and then the official “Rainbow in the Dark” clip, which begins sequel-like in a White Castle and provides a good look at the antic principals — Himanshu Suri a/k/a Heems, a pudgy Indian-American with a slack-jawed Queens accent, and Victor Vazquez a/k/a Kool A.D., a skinny Bay Area Afro-Cuban-Italian-American with a full beard and a cleaner California-stoner delivery. “Rainbow in the Dark” is from Das Racist’s Relax, released on their own Greedhead label in 2011 after a succession of frustrated bizzers failed to pin down a major-label deal these rappers they loved would sign, although they did sneak onto a Kmart commercial. Released in September, it proved my album of the year once I got the hang of it, and was followed in no time by three and then four solo mixtapes: Kool A.D.’s The Palm Wine Drinkard and 51 and Himanshu’s/Heems’s Nehru Jackets and Wild Water Kingdom. These can also be downloaded gratis, although because I came late to 51 after The Palm Wine Drinkard underwhelmed me, I had a touch of trouble locating a site I was sure wouldn’t give my computer cooties. I succeeded, however. It was worth it. Incorporating hype man Ashok Kondabolu a/k/a Dapwell, a Stuyvesant High pal of Heems who came to the fore in their live shows, Das Racist formed in New York in 2008 but were friends well before that — Vazquez and Suri met in 2003 in a Wesleyan dorm of color where Vazquez was a resident advisor. “Combination Pizza Hut and Taco Bell” got noticed right away even though its lyric — underpinned by a skinny laptop beat and augmented by some interjections, a few laugh lines, and many well-placed “What?”s — comprises 20 repetitions of “I’m at the Pizza Hut / I’m at the Taco Bell / I’m at the combination Pizza Hut and Taco Bell.” Many in the indie world hated it, but more loved it. There are themes there if you want — the ubiquity of corporate culture, the limits of cellphone communication, how funny life gets on weed, how screwed up life gets on weed. But the secret is in the timing — in how intimately the two rappers interact and how inefficiently they connect. It’s very funny, and fairly screwed up. In case you didn’t guess when I mentioned Wesleyan, Heems and Kool A.D. aren’t just very intelligent guys. They’re fluent in the language of the hipster intellectual — cultural studies-type Kool A.D. even more than Heems, who majored in economics and worked as a Wall Street headhunter post-college while Vazquez sang in an electropop band called Boy Crisis. Initially they were like alt-rappers gone to heaven. Where the average backpack MC believed he was a champion of pure hip-hop and couldn’t crash Rakim’s afterparty, they mocked every hip-hop convention and were accepted by gatekeepers who respected the outspokenness of their weird anti-racism and the originality of their weird skills — Jay-Z even chipped in a hook on “All Tan Everything.” They didn’t attract the core hip-hop audience, and often joked about how they made big bucks entertaining white crowds. But they occupied a special place in the hip-hop universe anyway. Post-breakup coverage has mourned the now-shelved “real” album expected to follow the major-label deal they finally signed with Sony-affiliated Megaforce in July. But Relax sounded plenty real to me — more carefully conceived sonically, thoughtfully paced thematically, and consistently executed track-by-track than either of the mixtapes that set it up. As usual with the hip-hop albums I love, it hit me as music first. Das Racist had never made much of beats per se, not twisty Timbaland contortions or slamming Eurodisco electronica, and they don’t on Relax either. But from the nine seconds of distorted priestly wails that precede the Latin/Indian hand-drums-and-keyb-chords bed of the opener through the electro-fanfare that heralds “Michael Jackson / A million dollars / You feel me? / Holla” right through the bubbly idiot cheer of the closing “Celebration,” my advance had ear-grabbing distinction, logic, and flow. To my surprise, five of its 14 tracks, including the first three, were produced by Patrick Wimberley of the bland little Sony pseudo-indie band Chairlift. Although known hip-hop beatmakers El-P and Diplo contribute tracks too, most of the production is by alt-rockers of varying repute, from Vampire Weekend’s Rostam Batmanglij down to an ’80s-channeling obscurity named Frances Farewell Starlite who seems to specialize in idiot cheer. If Relax‘s first idea is that these rappers with an indie-rock audience now have beats to match, the second is that since this is a proper album it’s damn well going to have hits on it. Hence the danceable yet sardonic and surreptitiously complicated “Michael Jackson”; hence “Girl” and “Booty in the Air,” sexual come-ons in hip-hop’s r&b mode that are needy and adoring and insecure in a way hip-hop never is; hence an apparent novelty follow-up that parades out of that White Castle as “metaphysical spiritual lyrical murder” and doubles back on itself uncountable times; hence the two putatively audience-friendly closers that follow, Kool A.D.’s hippie-sappy “The Trick” swearing “We’re in heaven at least I really think so” and “Celebration” juxtaposing such lines as “If you wanna be me you can be me / If you wanna be you you can be you,” “We can sell it to you,” and “Blah blah blah blah blah blah blah.” But things have changed on the less surprising songs too. Kool A.D. is the cool, wiggy, politically principled old head throughout, Heems the anxiety-prone bigmouth worried about money and increasingly conscious of his particular racial heritage and immigrant roots: devastation in Kashmir, his father bagging groceries at Pathmark, and old Urq (sp?) longing for home in the title song, with Indian music carrying three other tracks. But as a consequence, the line-trading byplay that had us hoping Das Racist would turn into Beastie Boys for a multiethnic America is no longer front and center. Although Relax got decent reviews, the flavor-of-the-month disease that afflicts all Web sensations was by then generating some impatience with the group’s browner-than-thou tomfoolery, and hindsight being 20/20, it’s tempting to discern disquiet in this complex yet little-pondered album. Kool A.D.’s January The Palm Wine Drinkard was a conventionally if also experimentally ramshackle mixtape that gestured toward beats per se and proved mostly that he damn well refused to be clever on demand. But just weeks later, Heems d/b/a Himanshu’s Nehru Jackets staked out new turf from its opening line: “I don’t want to wait for my life to be over.” More aggressively Indian than Relax, it peaks with two tracks that aren’t: the girl-crazy “Womyn” — “Sometimes women is like the best flower / Yo, women, yo, they got the power / Yo, women, they like to take showers / And when they let you take them with them it’s really awesome / Women used to watch Dawson’s / Creek / . . . ” — and the straightest political rap either jokester has ever dared. “NYC Cops” is exclusively about African-Americans — a deep-sampled, flat-voiced, outraged catalogue of well-remembered and obscure black people who’ve died from police violence. But Kool A.D. was not to be topped, and just three months later, 51 set him rhyming again while sustaining his groovealicious kick, with special attention to his native California and a general goofy-peacenik vibe — neither a Das Racist-associated rhetorical ploy. So then what happened? The public record is unclear as I write, but indicates that Kool A.D. threw it in a few months after the Sony deal was signed or maybe earlier, agreeing to keep the decision under wraps until — when? The Sony album was done? Released? Toured behind? No idea. Hypeman Dapwell has reported that life on the road was wrecking interpersonals as it has thousands of times before, and it’s not hard to imagine personal frictions arising — something along the line of laid-back elder Kool A.D. unable to take his partner’s overweening ambition, depressive moodiness, alliance with Dap, dirty drawers, whatever. Such speculation won’t end when and if some official account is finalized, and I suppose it’s conceivable there’ll be some kind of reconciliation. What happened in Munich December 1st, however, is pretty clear. 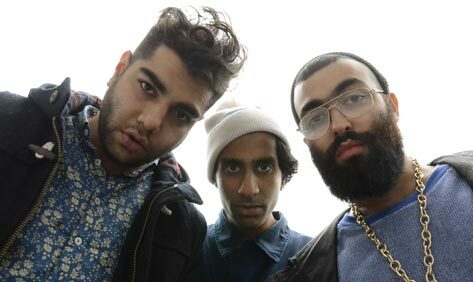 With Das Racist booked for the On3 Festival, Heems came onstage and announced that although he’d perform some Das Racist songs the group had broken up. Kool A.D. confirmed this via Twitter. Deeply bummed, Dap reckoned that he’d never make such easy money again. It’s possible Kool A.D. is jealous. A few weeks before, Himanshu, as Heems this time, had released yet another first-rate mixtape: Wild Water Kingdom, his most personal and also his most avowedly mock-gangsta music to date. The two partners had always been equals. But post-Relax Heems has been the more impressive artist by far, and with his business training he runs Greedhead as well. True, except for Relax Greedhead has overseen nothing but free mixtapes, and although Das Racist is sometimes credited with igniting an NYC alt-rap revival, so far their label has failed to make much hay for the likes of Le1f and Lakutis, although I’m partial to Heems’s sloppy Flushing homeboy Big Baby Gandhi myself. But running a label is the kind of thing that breeds resentment. My main regret about coming late to Das Racist is that I missed the period when they interacted intimately and inefficiently at the NYC shows legend claims popped up every week. I’ve seen them just once, at a free twilight concert in a Red Hook park last June, and to my chagrin Heems seemed distracted, leaving the entertainment chores to a clowning Dap and professorial beardo Kool A.D. But his old pal and his senior partner were so animated that by the end they brought Heems out of himself. A very mixed-race crowd cheered them all on. As Kool A.D. remarked professorially: “The city hires its own citizens to entertain other citizens. This is the future.” It kills me to think how unlikely I am to encounter quite such an antic political amalgam again.